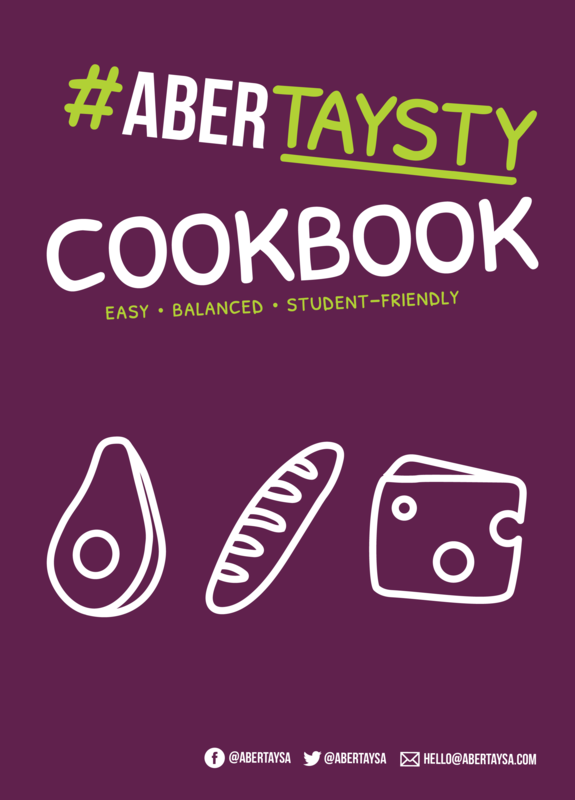 Abertaysty is a project provided by Abertay SA to offer free food to students. The food is sourced from FareShare, a charity set up to fight hunger, tackling food waste. Working with FareShare we purchase quality surplus food that is available to us each week. We try to get a variety of foods for a balanced diet of the donated foods each week. Follow @AbertaySA to find out when the food arrives. Our cookbook was created to help you get the most out of your food and your budget, and encourages you to learn to cook in an easy and fun way. As much as possible, our recipes are adaptable for different diets – making this cookbook suitable for anyone. All the recipes serve 1 – making it easy for you to not waste food and simply multiply the ingredients for more people! A range of quick, easy and economic recipes; often contributed by real students. A great place for learners to start out. There are also lots of friendly tips for students on eating well, budgeting and getting the most out of your cupboard! Find a range of recipes by the community and TV chefs. A great place to look for a range of recipes or inspiration. Loads of tips on cooking, what spices to pair with what, and is a great way to level up your cooking skills! What herbs & spices go with what? Each week, we invite students who use the service to answer a question or two. This helps us to better tailor the campaign to your needs, and also measure the coverage and impact of the campaign.